The 1980s and ’90s rivalry between Wayne Rainey and Kevin Schwantz was one of the greatest in the history of motorcycle racing. With his hot lapping days behind him now, he instead runs the MotoAmerica series, where he wants to see the same fierce competitive energy in up-and-coming riders. And it’s starting to look like he’ll get his wish. MotoAmerica is in its third season as the successor to the old AMA Pro Superbike championship with Rainey at the helm. The series heads into its third of 10 rounds at Virginia International Raceway this weekend. The Rainey-Schwantz rivalry started in the domestic U.S. series and then moved to the 500cc World Championship. Even though the two riders patched up their frosty relationship toward the end of their careers, you can still tell how they savor their victories and rue their defeats against each other. Today, Cameron Beaubier, 24, has been the star of MotoAmerica so far, winning the first two seasons dominated by his Yamaha team. But Suzuki has chosen the U.S. series to develop its new GSX-R superbike, and former Moto2 champion Toni Elias of Spain has won three of the first four races this year. Rainey is thrilled that Suzuki is pushing the envelope and and that Honda is also getting back into the fray and developing its new CBR1000RR SP2 in MotoAmerica. Rainey said Ducati was also trying to put a race team together, but ran out of time before the season got underway. Jake Gagne rocks the wheelie at Road Atlanta, but Honda’s new CBR1000RR SP2 is still a work in progress in MotoAmerica. Even though one of MotoAmerica’s main objectives is to foster the talent of U.S. riders, Rainey says he has no problem that a Spaniard has dominated the season so far. To Rainey, this is just the challenge that Beaubier—or any other American rider with international aspirations—needs to prove their mettle. “The theory is that we’re a very competitive series, so if you race hard here and you get a chance to ride another series, it’s not like you’re at another level again,” he said. Wayne Rainey, right, wants no more Mr. Nice Guy from Cameron Beaubier, center. 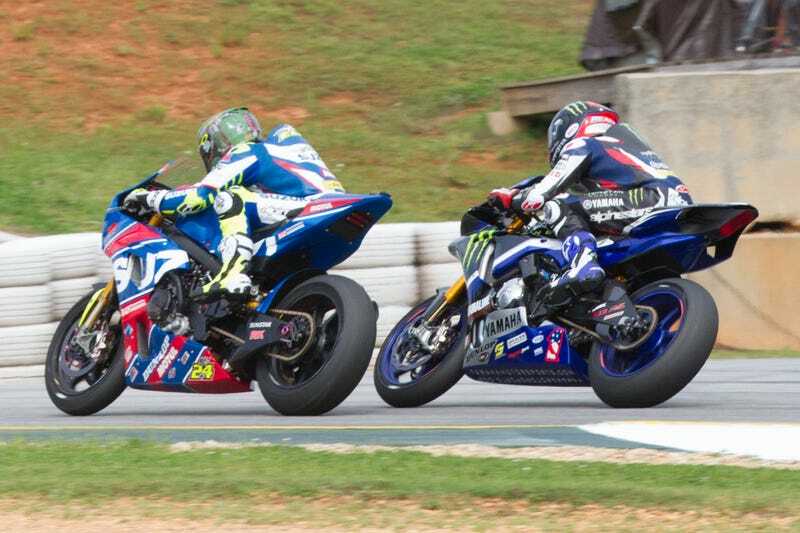 Elias was fuming over two passes Beaubier put on him in the first race at Road Atlanta, saying afterward that he’d remember those moves down the road. And in Race 2, Elias slammed the door on Beaubier’s late challenge. And that’s cool with Rainey? Roger Hayden leads Toni Elias, Josh Hayes, Cameron Beaubier and Josh Herrin at Road Atlanta. Beaubier was poised to be the next big thing among American motorcycle racers when he went to Europe to compete in the 125cc world championship (now known as Moto3) in 2009. His teammate was an equally fresh-faced kid named Marc Márquez, and they raced against future MotoGP riders like Andrea Iannone, Bradley Smith, Jonas Folger and Johann Zarco. Márquez finished that season in eighth and was well on his way toward superstardom. Beaubier came in 29th and was out of a ride. Beaubier got to see Márquez take his fifth victory out of five runnings at the Circuit of The Americas when MotoAmerica was the undercard at the Texas race last month. Beaubier returned to the U.S. and struggled to gain his footing. But he said the experience of clawing his way to the top of MotoAmerica has made him a better rider. “Sometimes you’ve got to take a step back to take steps forward,” he said. In the paddock, Beaubier is laid back, friendly and quick with a smile. But that attitude only goes so far. “I guess I’m a little different on the track,” he told me with a grin. Rainey is looking forward to the day Beaubier no longer cares about such niceties.